Today is the day that we finally present our website to the Council of Public Liberal Arts Colleges. I could not be more thrilled to finally see the fruits of our labor on our finished website. While we ended up not always being able to meet in person, Rosanna and I always made full efforts to get our parts of our work done. As our instructors pointed out, we have plenty of Internet tools that we can use to collaborate from afar. I think that our instructors would agree that we put the resources we had available to full use. For instance, I think about how Rosanna and I strategically color-coded our Google Doc sheets and assigned tasks to one another that we knew would take advantage of our individual strengths. One thing was always consistent: We were always working on at least something each week. And when we did get together, we put our heads together and got as much finished as we possibly could with the time we had allotted. Rosanna and I spent a full week going over suggestions from our peer review session and the Google Doc our instructors sent to us. The vast majority of the work we put in last week was content-based; we spent hours making sure that we added more interpretation and analysis of our case and revised pages until we couldn’t bear to look at our website anymore. When we didn’t trust ourselves to make edits, we sought assistance from our peers and family. There were a few times when I had to tell Rosanna that there are moments when we have to do what I call “killing our darlings”. Although we loved the three panels of news coverage that we previously had on the home page, it didn’t get the response from our peers and instructors that we had anticipated. Rosanna and I had to brainstorm what to do with the homepage. I suggested we go with what started our research on our case to begin with: news coverage of The Bluest Eye, but in a medium that wouldn’t take our viewers away from the website. So we went with a video instead of reading material. I thought that we had put in a lot of brain power while we were building our website in the beginning, but now I’m realizing that was all a warm-up in comparison to the work we put in last week. I think we exceeded our initial expectations of what would go up on our website. For example, we added a page that discussed the merit of The Bluest Eye and how people may analyze merit in general. We also put all of the technology we said that we would utilize into action. For instance, we made a digital timeline and used Coggle to map out our website. I think that Rosanna and I make a great team. While we tend to operate and think differently, we still manage to combine our strengths to create the best final product possible. Rosanna is definitely the more technologically inclined between the two of us, so I often had to seek help from her when I had trouble with website layout or troubleshooting technical difficulties. In return, I often found myself assisting Rosanna in written communication. This is a photo I took from my last website revision session with Rosanna. 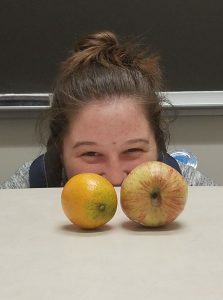 She’s sitting behind a random apple and orange that someone left on our study room table.